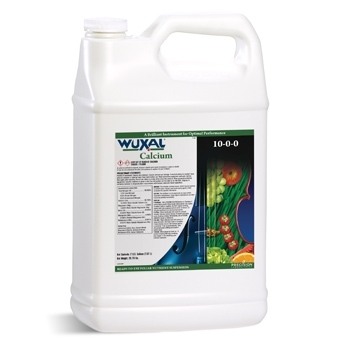 Wuxal Calcium is a suspension foliar fertilizer with a high calcium content suitable for the prevention of calcium deficiencies in specialty and row crops. Supplemental nitrogen and magnesium are provided along with a complete package of chelated micronutrients. Wuxal formulations include adjuvants that buffer spray solution and improve spray characteristics such as wetting and retention. Weekly applications beginning 14 days after planting. At fruit set, Berry closure and ripening. Weekly applications after 1st fruit set to beginning of maturation. 2-3 weeks after reaching 4 leaf stage through start of head formation. From 1st fruit set through fruit development. Increase yield, brix degree, and shelf life. Reduce post-harvest rot. Formation of side shoots-crop cover and at flowering. 2-3 times during cell division and 2-3 times during fruit enlargement. Prevention of bitter pit, improved fruit firmness and shelf life. Improved fruit firmness and botrytis resistance, reduced splitting. Improved seed set and yield, reduced seed abortion. 3 applications during period of fruit enlargement. Improved fruit firmness and shelf life. 3-4 times during period of fruit enlargement. Reduction of splitting and formation of peel microlesions. Before boom, during bloom and during fruit development. Improved fruit firmness, size and resistance to botrytis.